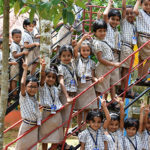 Our School Uniform (Readymade), Tie, Belt & Socks will be available in Poothurans, Angamaly. Our uniform shoe will be available in City Shoes & City Tower, Angamaly. From 1st June to 31st August you are free to wear Plain Black Sandals, but 1st September onwards it is compulsory to wear Black shoe and socks.